聂虎, 曹莎莎, 赵明朗, 杜林方. 红尾蚺和原矛头蝮基因组微卫星分布特征比较分析[J]. 四川动物, 2017, 36(6): 639-648. NIE Hu, CAO Shasha, ZHAO Minglang, DU Linfang. 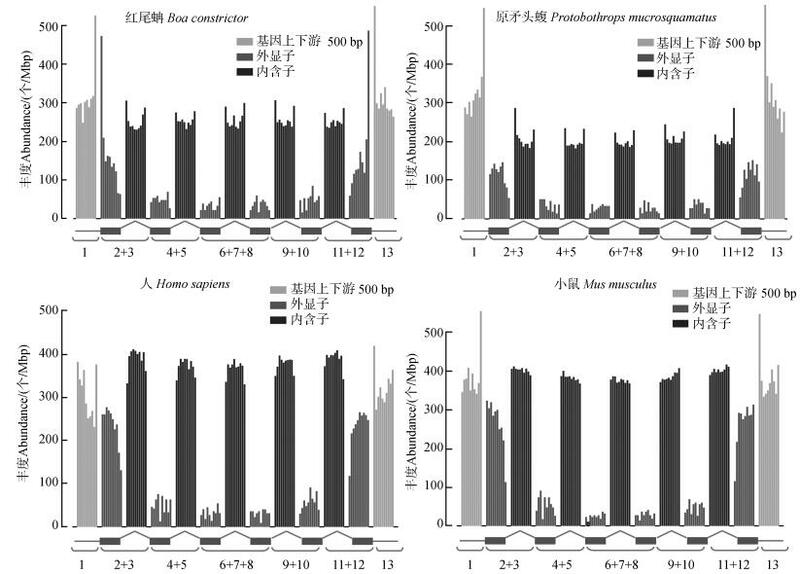 Comparative Analysis of Microsatellite Distributions in Genomes of Boa constrictor and Protobothrops mucrosquamatus[J]. Sichuan Journal of Zoology, 2017, 36(6): 639-648. *通信作者 Corresponding author, 杜林方, E-mail:dulinfang@scu.edu.cn. Abstract: In this study, we analyzed and compared the distributions of perfect microsatellites in the genomes of Boa constrictor and Protobothrops mucrosquamatus. Using the MISA tool, a total of 398 860 and 422 364 microsatellites were identified in genomes of B. constrictor and P. mucrosquamatus, respectively. The total length of the identified microsatellites was 8 550 741 bp in B. constrictor and 12 243 226 bp in P. mucrosquamatus, accounting for 0.59% and 0.73% of each genome, respectively. The abundance of microsatellites was 275.46 no./Mbp in B. constrictor and 252.33 no./Mbp in P. mucrosquamatus. In B. constrictor genome, mono-nucleotide repeat was the most abundant, followed by tetra-nucleotide, di-nucleotide, tri-nucleotide, penta-nucleotide and hexa-nucleotide repeat, and A、AC、AAAT、AG、AAT were the 5 most abundant repeat units. 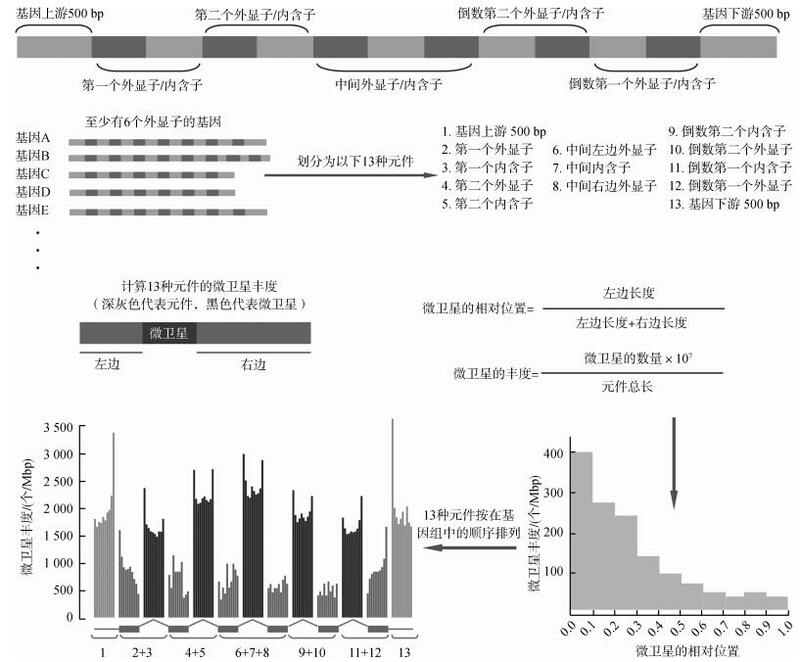 In P. mucrosquamatus genome, mono-nucleotide repeat was the most abundant, followed by tri-nucleotide, tetra-nucleotide, di-nucleotide, penta-nucleotide and hexa-nucleotide, and A、AAT、AC、C、AAAT were the 5 most abundant repeat units. In both species, the abundances of microsatellites in intergenic region was the highest, followed by intron region and exon region, and the lowest was in coding region. These phenomena indicated that microsatellites in coding sequences were subject to the greatest selective pressure. The positional specificity of microsatellite abundance distributions in these 2 snakes were similar, that is, the abundance of microsatellites was the highest in the upstream and downstream 500 bp regions of genes, followed by intron regions and exon regions. Tri-nucleotide repeat was dominant among the 6 repeat units in the coding sequences of both genomes. The number of coding sequences containing microsatellites were 1 480 and1 397, among which 736 and 733 were assigned with GO terms of known function in genomes of B. constrictor and P. mucrosquamatus, respectively. These coding sequences resulted the similar GO classification outputs, but behaved in a lineage manner comparing with other species. This study made a great convenience to develop large number of high-quality microsatellite markers for these two snakes and provided meaningful underlying data for further exploration of the biological function of microsatellites in their genomes. Notes：Abundance=number of certain repeat microsatellites/genome size; percentage=number of certain repeat microsatellites/total number of microsatellites. Notes：Number in parenthesis indicates occurrence number of the repeat and the following percentage means the percentage in the repeat. 图 3 红尾蚺、原矛头蝮、人和小鼠基因区及其上下游微卫星的丰度分布 Fig. 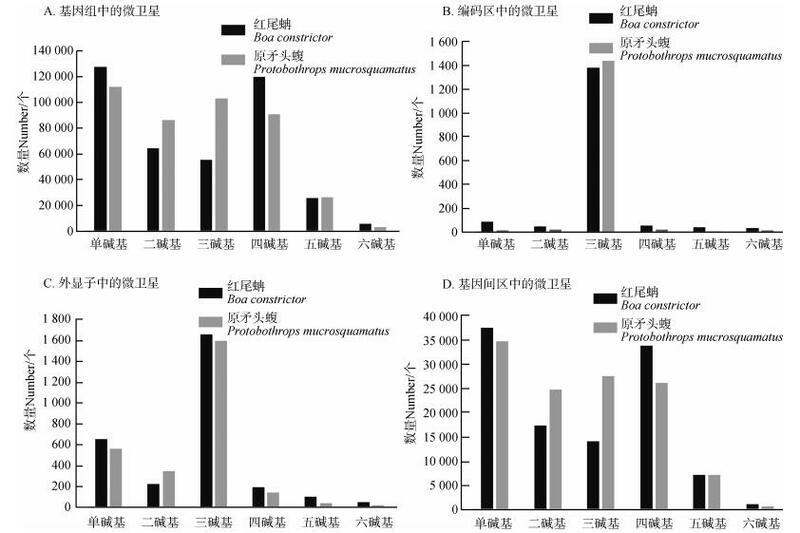 3 The microsatellite abundance in gene regions and their upstream and downstream regions of Boa constrictor, Protobothrops mucrosquamatus, Homo sapiens and Mus musculus 1~13同图 1。	1-13 as same as in Fig. 1. 高焕, 刘萍, 孟宪红, 等. 2004. 中国对虾(Fenneropenaeus chinensis)基因组微卫星特征分析[J]. 海洋与湖沼, 35(5): 249–254. 李成云, 李进斌, 周晓罡, 等. 2004. 粗糙脉孢菌基因组中的微卫星序列的组成和分布[J]. 中国农业科学, 37(6): 851–858. 李午佼, 李玉芝, 杜联明, 等. 2014. 大熊猫和北极熊基因组微卫星分布特征比较分析[J]. 四川动物, 33(6): 874–878. Fujimori S, Washio T, Higo K, et al. 2003. A novel feature of microsatellites in plants:a distribution gradient along the direction of transcription[J]. FEBS Letters, 554(1): 17–22. Laurie JV, Janalee PC. 2009. Herpetology:an introduction biology of amphibians and reptiles (third edition)[M]. London: Academic Press: 551-578. Yin W, Wang Z, Li Q, et al. 2016. Evolutionary trajectories of snake genes and genomes revealed by comparative analyses of five-pacer viper[J]. Nature Communications, 13107(7): 1–11.